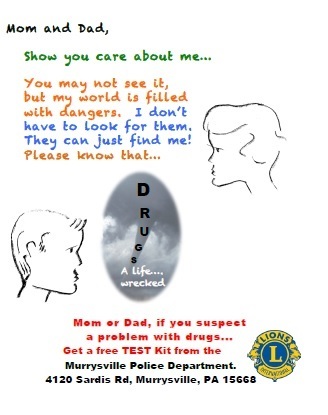 Murrysville Lions Club's Information Website - WE SERVE. October 25, 1951 saw the birth of the Franklin Township Lions Club (forerunner of the Murrysville Lion Club) as 27 members of the local community united in community service. By 1955 membership had doubled to 54, increasing yearly until it peaked at 90 members. Current membership (November 2017) stands at 28 Lions. Since Helen Keller threw down the gauntlet in 1925, the primary objective for the Lions has been the conservation and restoration of sight. We are the "Knights of the Blind". From the beginning the Club paid for eye exams and/or glasses for needy persons, mostly children who are referred to us by the schools. Hundreds of patients have been tested and given glasses, if needed. In addition, facilities like the PA Lions Camp Beacon Lodge, Leader Dog for the Blind, the PA Eye Research Foundation, and various Laser and Diabetes Centers throughout PA have benefited from Club donations. In 1975, the Club started regular donations to the Lions Club International Foundation, including over $19,000 during Campaign SightFirst in the mid 1990s. In 1960, the Club started the Student Scholarship Program. The student's interest in serving humanity featured heavily in winning the scholarship. In 1971 the program changed into a very short-lived loan program. The current Student-of-the-Month Program started in 1992, along with the Student-of-the-Year Scholarship. In 1971 the Club started the Teenage Golf League, which still exists today. When Murrysville's Community Day started in 1981, the Club got into the act with it's first Bash-a-Car. In 1984 the Club held the first 10K Race. Today, the Club sponsors the Spin Art Booth at what is now Murrysville's Summer Celebration. One of the primary objectives of a service organization is to raise money to support its many humanitarian causes. Over its 60+ years, the Franklin Twp./Murrysville Lions have raised over $250,000 for their charities. 1. To create and foster a spirit of “generous consideration” among the peoples of the world through a study of the problems of international relationships. 2. To promote the theory and the practice of the principles of good government and good citizenship. 3. To take an active interest in the civic, social, and moral welfare of the community. 4. To unite the members in the bonds of friendship, good fellowship, and mutual understanding. 5. To provide a forum for the full and free discussion of all matters of public interest; partisan politics and sectarian religion alone excepted. 6. To encourage efficiency and promote high ethical standards in business and professions; provided that this club shall not hold out as one of its objects financial benefits to its members. Copyright © 2003-2019 Murrysville Lions Club. All rights reserved.